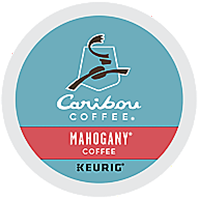 Mahogany is a dark brew that is rugged by nature and roasted to perfection. Coffees from Sumatra, Guatemala, and El Salvador are combined to achieve a perfectly balanced blend. Sumatra provides Mahogany's bold dry spice and aromatic wood flavors, while the hint of floral and vanilla of Guatemala wonderfully complements the primary Indonesian flavors. Each K-Cup pack is an air-tight, mini-brewer that locks out oxygen, light and humidity while locking in freshness and flavor.